Tiliqua gigas are very docile, curious lizards. Heavily build, broad bodies set on small legs with delicate toes. Broad, blunt triangular head typical of skinks. Deep, berry blue tongue vividly offset against the deep pink interior of mouth. There are currently 3 subspecies of Tiliqua gigas. First subspecies to be recognized is Tiliqua gigas gigas (Indonesian blue-tongued skink), Tiliqua gigas keyensis (Kei island blue-tongued skink) and Tiliqua gigas evanescens (Merauke blue-tongued skink) which is pictured. There is also an undescribed Irian Jaya (Tiliqua sp). Distribution : Indonesia, Papua New Guinea (Surrounding Islands). Their housing should ideally be an absolute minimum of the space in a 1.2 x 0.6 x 0.6 meters (4 x 2 x 2 feet) vivarium, however the larger the better as these are very active lizards thus an enclosure measuring approximately 1.8 x 0.9 x 0.6 meters (6 x 3 x 2 feet) would provide them with fantastic opportunities. Babies can also be started in the large adult enclosure size, not suffering from any type of agoraphobia, instead being incredibly inquisitive and explorative of their surroundings. The enclosure material can be any that is able to withstand the simulation of a tropical environment, such as heavily sealed wooden vivaria, glass terraria with limited ventilation to retain humidity, closed top aquaria and finally plastic/acrylic enclosures with adaption for overhead heating and UV equipment fittings. A height of meters 0.6 (2 feet) or even more is great, and can be even higher as they are well known to climb and bask at a medium height on thick branches or other decor when provided the chance to, despite being often listed as semi-fossorial. These should be provided multiple hides along the enclosure, alongside the deep substrate, This allows them the choice to escape view, light and access varying temperatures when required. Thus a good base practice is to at the very least provide a sizeable hide on the heated end, and the cool end. However an enclosure large enough should include many hides, of varying types. These hides should allow the skink to fully escape view, and fit their entire body, this is worth considering when dealing with large specimens. Being tropical species, and very often burrowers, their substrate should replicate this. The substrate should allow burrowing for a large animal, and thus be ideally 0.15-0.17 meters (0.5-0.55 feet) deep, however it can be much deeper! The ideal substrate types include coir/coco fibre, peat, sterilized top soil, orchid bark and sphagnum moss. Mixes of these substrates work fantastic in attempting to replicate their wild environment. Dry substrates should not be used at all, including paper, aspen, or hay as these would inhibit humidity, natural behaviors and cause ill health such as dysecdysis, and behavioral issues. These require a large temperature gradient due to the conditions in their tropical ranges, and the size of them in relation to enclosure size. These should also be kept at a slightly lower temperature than their Australian counterparts. Their basking area should be provided via over-head heat from a basking bulb attached to a dimming thermostat or ceramic heat emitter attached to a pulse thermostat and should reach 30-32°C (86-90°F) with a gradient falling to the other side of the enclosure which can be allowed to reach room temperature or as low as 21-26°C (70-78°C) reaching the lowest during night drops. 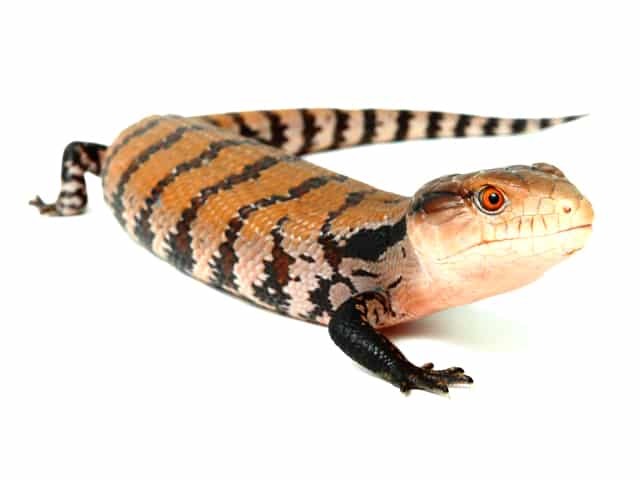 A common misconception is that Blue Tongued Skinks do not require UV, however this is utter presumption as there is no reason why they are exempt from the same care as other species. Thus UV and a full photoperiod are essential, as supplementation alone is dangerous via the risk of over or under-supplementing of vitamin D3. They can be provided UV ideally either 10-12% and either T8 or T5 however T5 is far more efficient, modern UV equipment being able to fully simulate wild UV index’ when set up correctly. This UV equipment should be fitted the same side as the basking area allowing a UV and photo gradient so the animal can escape it on the opposite side and under décor should it want to. They should be provided with constant access to fresh clean water via a bow or large tub of the owner’s choice which is changes daily and when soiled in, which they may often do. This water area can be made large enough to swim in, if space allows, however this is not necessary. These are tropical reptiles and thus their humidity should replicate that found around tropical Indonesia. Within the enclosure this should range between 60% and 90% humidity, allowing for spikes and falls. The enclosure can be sprayed daily to aid keeping this humidity high. These skinks can have an incredibly large and varied diet, being omnivorous. Thus their provided diet should simulate this. A good captive system to use (which can be jigged about with slightly increased protein if desired for picky skinks) is 50% vegetables, 40% protein sources and 10% fruit. The fruit should not include citrus items, and can include blueberries, strawberries, raspberries, apple, and banana as well as many others. The vegetables can include a massive range including spring greens, bok choy, beet greens, kale, mustard greens and collard greens, this is easiest offered chopped up finely and added to the fruit and protein sources. Protein sources can include a massive range of live food invertebrates which can be offered often, items such as frozen thawed mice and day old chicks can be offered but rarely. Whole egg and egg yolk is also a fantastic protein source which can be provided raw, boiled and scrambled (only the egg!). Some people insist that they can be fed a diet of only dog food, however it is illogical to provide an animal with such a varied diet with a single foodstuff which is formulated for an entirely different taxon, thus while this can be provided and is good for enticing the most picky skinks, it should not be provided often. All meals should be supplemented lightly with calcium without D3 as UV is provided. If UV is not provided for whatever reason then D3 supplementation is required, however this situation is not advised due to the risks of over and under-supplementation and the ethical, biological and behavioral implications of not providing a reptile access to UV. Every other meal can be supplemented with reptile vitamins. A baby skink should be fed a meal of a couple teaspoons daily, moving to every other day at 3 months old, every three days from 6 months old, then allowing a change to a couple tablespoons of food once or split twice per week allowing small live food and fruit additions in between. Blue tongues are very susceptible to obesity, thus they should be monitored, avoid overfeeding them! They have an extremely low metabolism, once per week can be enough for an adult. Blue Tongued Skinks can be fantastic animals to handle, especially if captive bred, usually being docile, inquisitive and fun! They will constantly test the air, objects and hands with their tongue, as well as climb about. When handling it is important to not move too quickly when first picking them up, attempt to gain their attention before grabbing them, and approach at their height so as to not cause a defensive reaction from above. When picking up ensure to always support all four legs, as they will panic and often flail about if they do not feel secure! It is also worth noting that they do have rather sharp claws, and in a panic this can cause quite nasty shallow scratches and draw blood, thus it is worth avoiding allowing children to handle one that is not fully docile. A bite from these is also extremely powerful, and thus painful! As with general reptile husbandry, these should be spot cleaned daily to every few days, and fully cleaned out monthly to bi-monthly, depending on the condition and size of the enclosure. If kept bioactive, cleaning can be reduced to monthly spot cleaning and no full changes, however this takes a lot of consideration, and is not necessary. So long as hydration and humidity is appropriate as described above, shedding shouldn’t be an issue. They do not shed in one piece as snakes do, doing so in patches and sections, rubbing against décor. They will shed more often when younger as they will grow quickly. It is a good practice to note when sheds occur, and then check that the shed has fully come off, checking the toes, legs, head and tail for retained shed. Should there be retained shed, up humidity and monitor it for a few days, if it still remains, attempt to use a wet cotton bud to dislodge the scales. MBD – Metabolic Bone Disease is where the animal’s body either does not have enough calcium or vitamin D3, or both! Calcium is required for healthy bone structure and muscle movement as well as many other uses, D3 is a vitamin that allows the use of calcium within the body. If there isn’t enough of either the body takes calcium from the skeleton causing weaknesses, breakages and malformation. This is often seen in skinks via kinks, dips, growths or abnormal movement. Severe MBD will cause their jaw to become soft and unusable. This can be treated if not too severe, with advice from an exotics vet! Prevention of this involves ensuring that UV is provided appropriately to allow D3 production and replaced when needed (6-12 months depending on manufacture specification), as well as closely monitoring the calcium/phosphorus ratio within the diet, as both are needed however the calcium should be much higher as phosphorus inhibits calcium uptake. Ecto and endoparasites – Ectoparasites are external and involve mites and ticks. Mites are often seen in captivity sadly, and are noticeable via small black dots on the skink’s scales, and slightly upturned scales. If discovered the skink should be treated with an appropriate reptile mite treatment. Contact a professional such as a vet or manufacturer of a treatment such as sprays to ensure its safety of use with the animal. Alternatively predatory mites (Hypoapsis miles) can be bought and added to an enclosure which can decimate a mite population. Endoparasites are internal, it is common practice to have your reptiles faecal tested to determine whether treatment is required, in the UK this is commonly done via PALS, the results can be used alongside exotic vet advice to determine treatment. Respiratory Infections- Should the humidity fall too low, these can get respiratory infections, this is often noticed via wheezing (NOT the usual skink huff!) and bubbling in the throat, mouth, nose and eyes. Should symptoms be noticed seek the advice of an exotics vet immediately, who will determine the severity of the infection. Some prescriptions can involve antibiotic injections, however less severe examples can be solved via nebulizing the animal with a specific veterinary disinfectant such as F10. Dysecdysis – This is trouble shedding, as noted above it is a good practice to note when sheds occur, and then check that the shed has fully come off, checking the toes, legs, head and tail for retained shed. Should there be retained shed, up humidity and monitor it for a few days, if it still remains, attempt to use a wet cotton bud to dislodge the scales. Should an animal be found with severe shedding issues, then an exotic vet should be seen to determine the next step.